Behind the Beautiful Forevers is stunning. 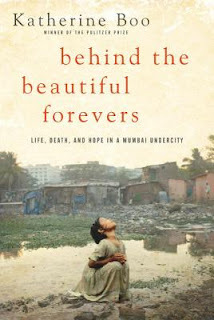 Boo writes about the extreme poverty of a particular slum in Mumbai. The struggle to overcome religious differences, alcoholism and the lack of jobs are day-to-day issues for the residents of the Annawadi settlement Education is almost non-existent. Raw sewage flows throughout the slum. Suicide is common. Government corruption is rampant. Boo spent a number of years embedded in the Annawadi slum and she writes about the people there realistically and with compassion.The hope that these people have is inspiring. They work hard and believe that they are one lucky break away from making it. This book is an eye-opener that I can't recommend highly enough. A conversation on Twitter led Nadia (from A Bookish Way of Life) and I to read this book at the same time. Check out here review HERE! I've had this on my list of books to read. I'm very interested in it. I have great friends that are Indian Americans. Thanks for the review. It's a beautiful book, I hope you get to it soon Heidi! I've been wanting to read this since it came out, but I haven't gotten around to it yet. It sounds so amazing. It seems like a book that would really put things into perspective. Move it to the top of your tbr pile, you won't be sorry! I'm glad you liked this one. I thought it was stellar. Thanks Kim! I think I may have heard of it for the first time on your blog? I loved your review! You are so right - this book is stunning! I'm so glad we read it :) Definitely one I won't forget anytime soon. Twitter is good for something! This proves it ;) I'm with you, I won't forget this book. I can't wait to read this! Even the title just sounds beautiful. I tried to comment on Nadia's post, but Blogger was not liking me today! When I got to the part in the book that explained the title I was all, ohhhhh now I get it! ;) Gorgeous read, just gorgeous! I cannot get enough reading about India and South Africa. I want to travel to both very much. I especially adore reading about them in the very cold winter. Great review. India just fascinates me to no end! If you haven't read this one you absolutely should! You will adore it. It's a rare author who can write serious journalism but keep it interesting. I've heard nothing but wonderful things about this book. The hope of people in that situation sounds a brilliant thing to read about, just because. (Rather than saying they're inspiring and all that). I'd definitely be interested to hear Boo's personal take on everything and how her other knowledge fits in the context of the settlement. I'd like to know more about Boo as well. I'd love to read her personal thoughts about the situation of the slum. It looks amazing, just from the cover. Wow. I've heard a lot of good things about this book but keep putting off reading it. I think perhaps because of the subject matter, which I'm sure will be depressing at amny levels. So nice to read your review. I voted for this book in the 2012 goodreads reader choice awards without even having read it myself! I heard about it and knew what it was about so I wanted it to get the attention of more readers. Having said and done that, I really need to make time to read it myself! You've reminded me to do so!